The “Blog” of “Unnecessary” Quotation Marks: The plumbing is "sensitive"
Ok, I'll take the euphemism about the plumbing, but I have no idea what is included in the category of "toilet paper." Thanks, Ty. 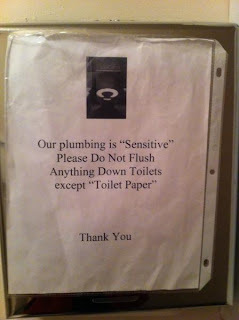 I think what is meant by the term "toilet paper" in this notice is the regular toilet roll we find daily in bathrooms. The key is to only dispose off toilet paper that is bio-degradable and can easily be broken down into smaller pieces by the power of the flush water. If other things are being flushed down the toilet, then the plumbing will definitely be affected because the entire system cannot afford to "digest" tougher materials that are difficult to break down. Such notices are important to prevent repeated plumbing problems which can be really expensive and time-consuming. I agree with Kevin, anything heaver than toilet paper that is designed to be flushed away easily is going to lead to a blockage. They are referring to things like sanitary towels that are bulky and thick and can quickly cause a block, and similar items. In some countries they have small bins at the side of the toilet to place tissue in as the plumbing systems there aren’t as sophisticated as ours.